These are a couple of my buddies from Guam. I’m on the left. The one on the far right was _?_ Williams (Unfortunately, his first name, along with the name of the other friend, has slipped my memory.) Williams was from Amarillo, TX, if I remember right, and took care of ship services (i.e. tools, parts, etc.). Last I heard, he went home and became a football coach. NOTE: If anyone recognizes either of these guys, I would appreciate you dropping me an email -or notifying them- so I can get in contact with them. Photo taken in Guam. Quite the view! 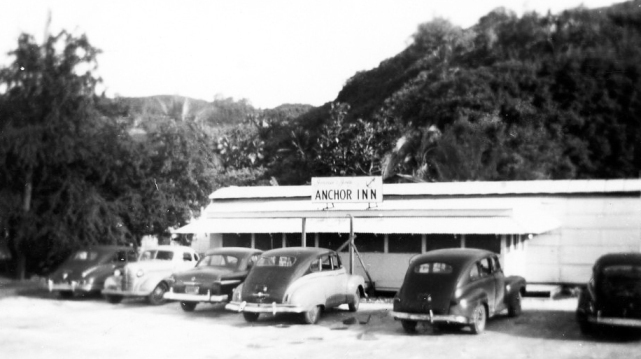 Featured below is the Anchor Inn beer hall, which must have been a popular hang-out, considering that I sent a photo of it to my parents. 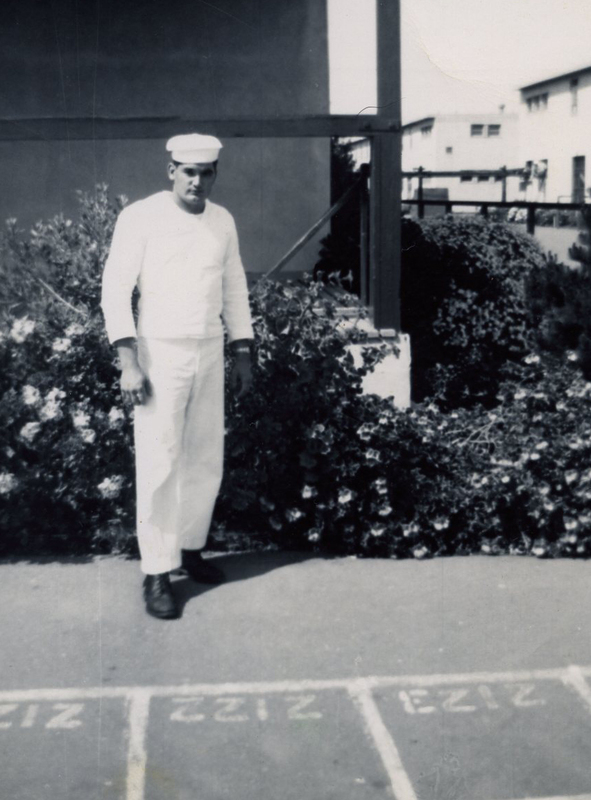 Dave, standing in front of barracks which were across the street from the VW-1 Squadron area. 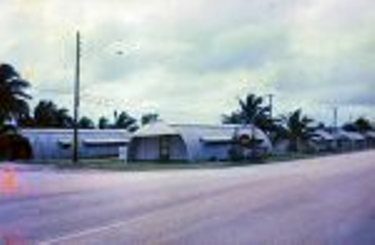 The following is an example of Quam living quarters and a picture of the VW-3 Squadron Office Buildings (which were quonset huts) found on the internet. The island of Guam, Guahan in native Chamorro, is a true cosmopolitan community that reflects the cultures of its original Chamorro inhabitants as early as 2,000 B.C., influenced by countless European, American, Asian, Micronesian, and other people who have occupied, visited and immigrated to Guam since the 16th Century. 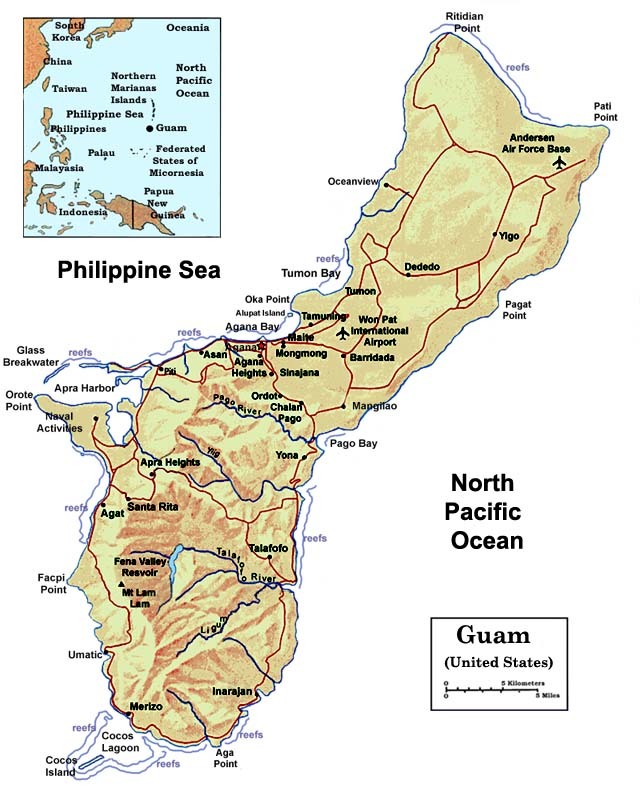 The original inhabitants of Guam are believed to have been of Indo-Malaya descent originating from Southeast Asia as early as 2,000 B.C., and having linguistic and cultural similarities to Malaysia, Indonesia and the Philippines. 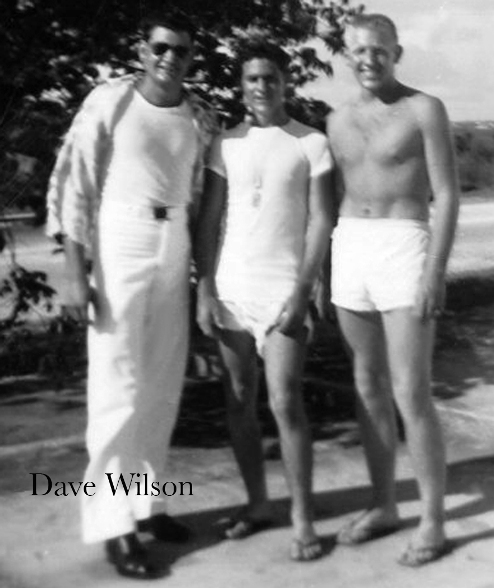 The Chamorro flourished as an advanced fishing, horticultural, and hunting society. They were expert seamen and skilled craftsmen familiar with intricate weaving and detailed pottery making who built unique houses and canoes suited to this region of the world. The Chamorro possessed a strong matriarchal society and it was through the power and prestige of the women, and the failure of the Spanish overlords to recognize this fact, that much of the Chamorro culture, including the language, music, dance, and traditions have survived to this day. Latte Stones are the stone pillars of ancient Chamorro houses. Found nowhere else in the world, theLatte Stone has become a symbol and the signature, of Guam and the Marianas Islands. Original Latte Stones were comprised of two pieces, a supporting column (halagi), made from coral limestone topped with a capstone (tasa), made from coral heads, which were usually carried several miles from the quarry site or reef to the location of the house. Customarily, bones of the ancient Chamorro’s, their possessions, such as jewelry or canoes, were buried below the stones. Latte Stones are respected and are untouched. A human interloper at Latte sites may encounter Taotaomoa, or ancestral Chamorro spirits. Archaeological milestones of ancient Guam are tied to the Latte Stones as: Transitional Pre-Latte (AD 1 to AD 1000), the larger Latte Period (AD 1000 to AD 1521), and Early Historic Period (AD 1521 to 1700). The eight Latte Stones shown here can be seen in Hagatna’s Latte Stone Park where they were transferred from their original location in Me’pu in Guam ‘s Southern interior. Today, many Latte sites can be found in Northern Guam and replicas and images of Latte Stones can also be seen all around the Marianas, such as the “Welcome to Guam” monument at the International Airport , carvings, jewelry, in print or the logo at the top of this paragraph. Read more about Latte Stones at the Official Government of Guam WEB site and Science Frontiers.Com. The first known contact between Guam and the West occurred when Ferdinand Magellan anchored his small 3-ship fleet in Umatac Bay on March 6, 1521. Hungry and weakened from their long voyage, the crew hastily prepared to go ashore and restore provisions. However, the excited native Chamorro’s, who did not share the Spaniards concept of ownership, canoed out first and began helping themselves to everything that was not nailed down. The weakened sailors had trouble fending off the tall and robust natives until a few shots from the Trinidad’s big guns frightened them off the ship and they retreated into the surrounding jungle. Magellan was eventually able to obtain rations and offered iron, a commodity highly prized by Neolithic peoples, in exchange for fresh fruits, vegetables and water. Details of Magellan’s visit, and the first known Western documentation of Guam and the Chamorro, come from the journal of Antonio Pigafetta, Magellan’s chronicler and one of only 18 original crew members to survive Ferdinand Magellan’s ill-fated circumnavigation of the globe. Guam and the other Mariana Islands were formally claimed by the Spanish Crown in 1565 by Miguel Lopez de Legazpi. In 1668, Jesuit missionaries led by Padre Diego Luis de San Vitores, arrived on Guam to establish their brand of European civilization, Christianity and trade. The Spanish taught the Chamorro’s to cultivate maize (corn), raise introduced cattle and tan hides, as well as to adopt western-style clothing. Once Christianity was firmly established, the Catholic Church became the focal point for village activities and Guam became a regular port-of-call for the Spanish treasure galleons that crisscrossed the Pacific Ocean from Mexico to the Philippines. In April of 1672, Jesuit Priest Padre Diego Louis de San Vitores and his Filipino assistant were killed by Chief Mata’pang of Tomhom (Tumon) for baptizing the Chief’s baby girl without the Chief’s consent. It is theorized that Mata’pang may have acted out of frustration from being subjugated to the harsh rule of a foreign Spanish King. Whereas Padre San Vitores tried to carry out his mission in a peaceful manner, the Spanish military ruthlessly governed the local populace to protect their Galleon Routes. 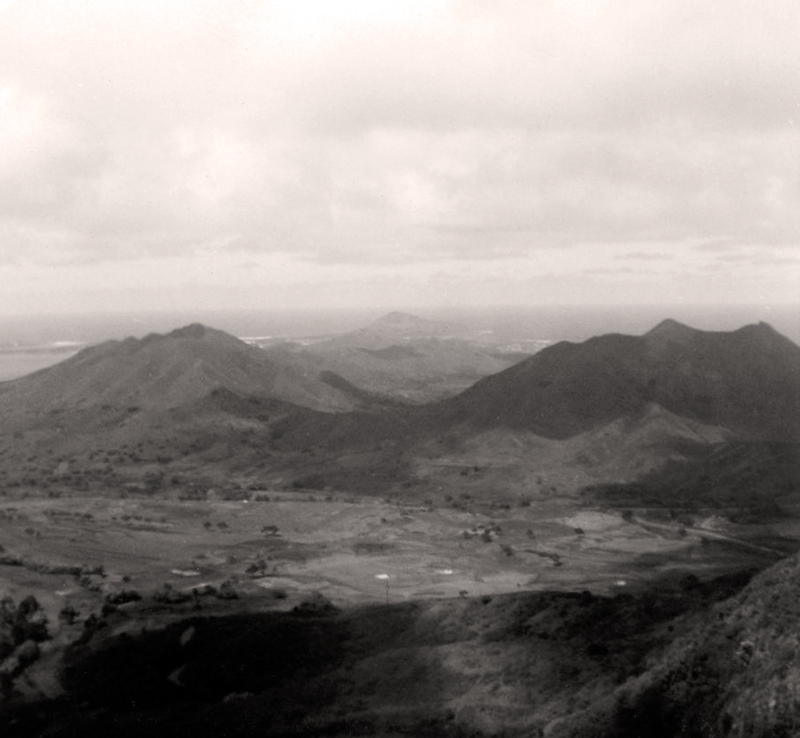 Regardless of Mata’pang’s motive, the death of Padre San Vitores lead to all-out war that nearly resulted in extinction of the Chamorro race. During the course of the Spanish occupation of Guam, sources have estimated Chamorro casualties to the fighting and disease reduced the population from 200,000 to roughly 5,000 by 1741, mostly women and children. After 1695 Chamorro’s were forced to settle in five villages: Hagatna, Agat, Umatac, Pago, and Fena, were monitored by the priests and military garrison, forced to attend Church daily and to learn Spanish language and customs. The Spaniards imported Spanish soldiers and Filipino’s to restock the population, marking the end of the pure Chamorro bloodline. In 1740, Chamorro’s of the Northern Mariana Islands, except Rota, were removed from their home islands and exiled to Guam . Mata’pang himself was killed in a final battle on the Island of Rota in 1680. Having been vilified for the incident that sparked the decimation of the pure Chamorro race, the name Mata’pang has evolved to mean silly. During the 18th century, the Spanish Galleons were preyed upon by English pirates who visited Guam to take on supplies and provisions. The Galleon Era ended in 1815 following the Mexican Revolution. 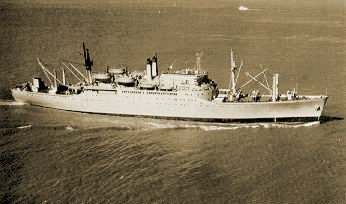 Guam was host to a number of scientists, voyagers, and whalers from Russia, France and England some of whom provided detailed accounts of the daily life on Guam under Spanish rule. Evidence of Spanish influence can still be seen across the island today. Early Spanish buildings, bridges, churches and forts can still be seen across the island, especially in the Southern areas. Spanish cannon still overlook Hagatna and Umatac Bays from Forts Agueda and Soledad, the Plaza de Espana, once the Spanish Governor’s Palace, still stands in central Haganta, and sunken Spanish galleons still lie under Guam ‘s crystal clear waters. The architecture and design of structures built long after the Spanish era, such as this bridge in Umatac, still have a distinctively Spanish quality. Guam was ceded to the United States by the Treaty of Paris ended the Spanish American War in 1898 and formally purchased from Spain for $20 million in 1899. At the time of the turnover, the local population of Guam has grown to about 10,000 inhabitants. U.S. President William McKinley issued an executive order placing Guam within the administration of the Department of Navy. CAPT R. P. Leary was appointed the island’s first U.S. Governor. 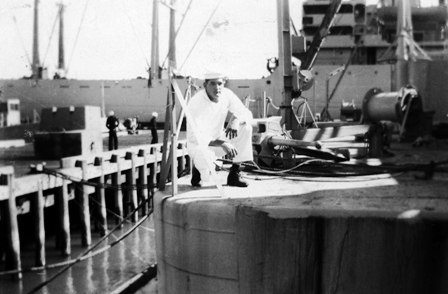 Under Navy administration, Guam experienced many improvements in the areas of agriculture, public health, sanitation, education, land management, taxes, and public works. 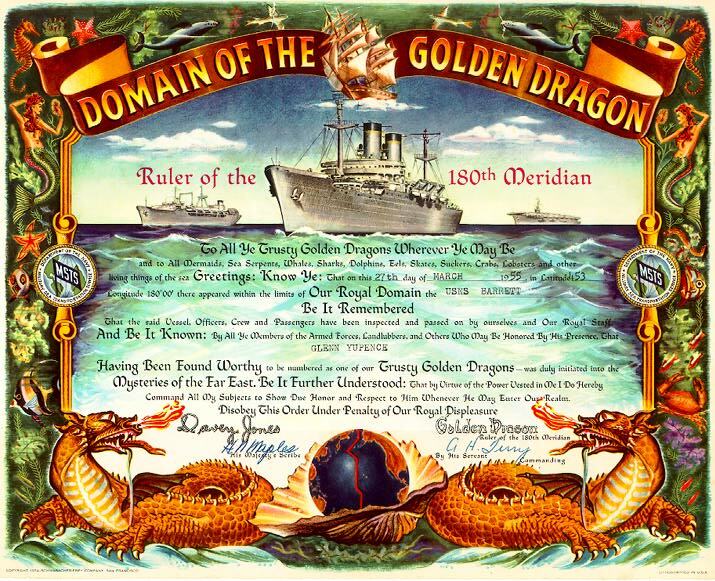 Orders issued by CAPT Leary on August 16,1899: regulated the importation and sale of intoxicating liquors; prohibited the transfer of land without the consent of the government; regulated the celebration of church and other holidays; prohibited concubine and required that marriage rites be performed between persons that were co-habitating; prohibited exportation of certain articles in common use among the people; required persons without a trade or regular employment to plant specified commodities and keep certain live stock; regulated the keeping of dogs and other animals running at large; abrogated the Spanish system of taxation and provided a new one; established a public system of nonsectarian education; and required each adult to learn to write his or her own name within a specified time. 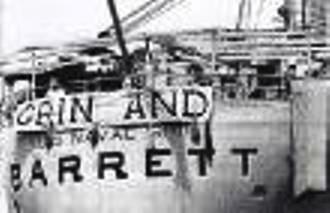 In 1927, the people of Guam, including schoolchildren who donated a penny each, collected $703.92 to have a ship’s bell and commemorative plaque manufactured in Shanghai, China. The bell was presented to the Navy and has served distinctively on each of the three USS Guam Naval vessels. 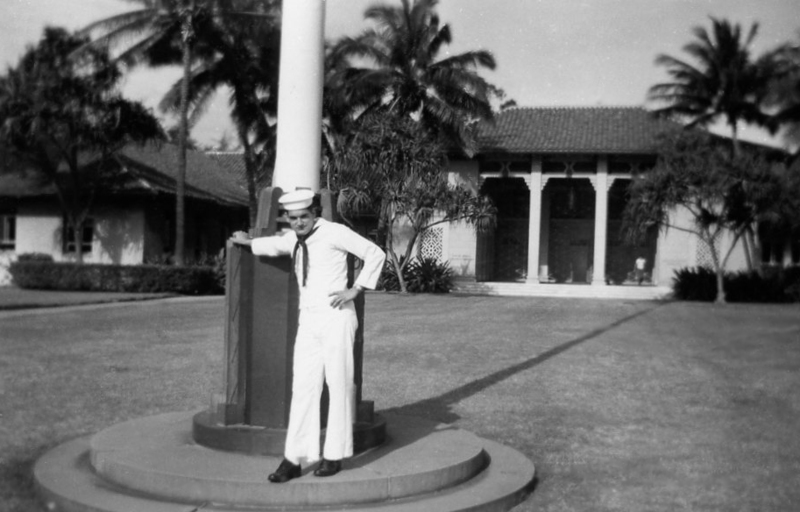 The U.S. Navy continued to use Guam as a refueling and communication station until 1941, when it fell to invading Japanese forces shortly after the attack on Pearl Harbor. On December 10, 1941, Guam surrendered to the Japanese South Seas detachment forces after a valiant defensive struggle by the island’s Insular Force Guard and a limited number of U.S. marines. 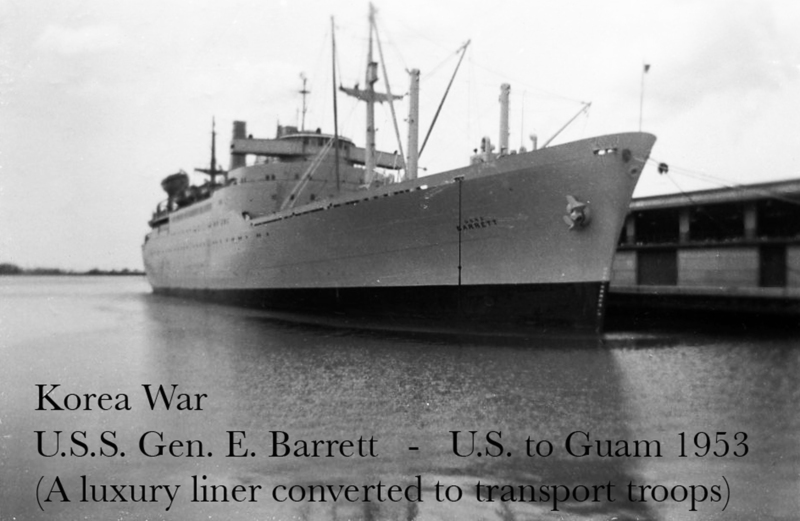 Guam became the only populated U.S. soil to be occupied by another country in World War II. Guam was renamed “Omiya Jima” and for 31 months, the people of Guam were forcibly subjected to intolerable hardships administered by the Japanese military. Although some measure of religious practice and business activities were permitted, atrocities, grenade slaughters and rapes were common. Concentration camps were established by the 29th Division of Japan’s Kwantung Army and approximately 600 Chamorro’s were executed. 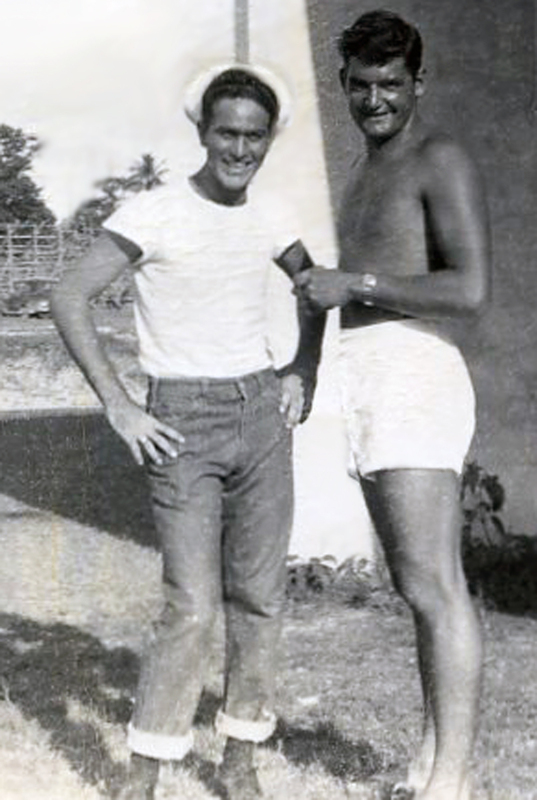 Some Chamorro’s were beheaded when the Japanese learned of the 3-year humanitarian effort by Chamorro’s to successfully feed and hide U.S. Navy radioman George Tweed who escaped in the initial invasion. Tweed’s cave is a popular “boonie stomping” destination on Guam today. Many landmarks of the Japanese occupation, including gun emplacements and tunnels can still be seen around the island of Guam today. 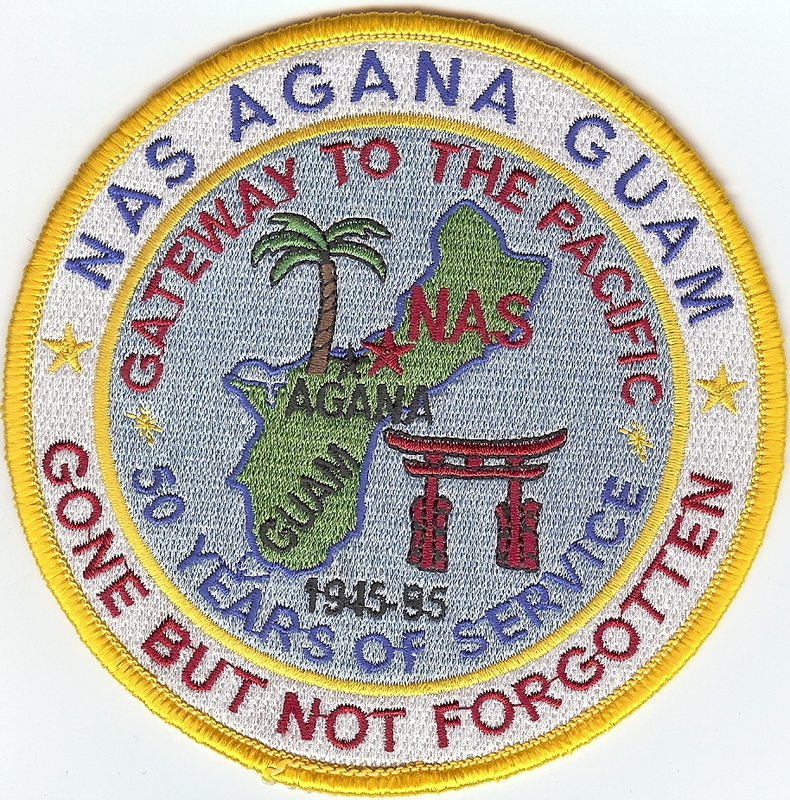 The campaign for the liberation of Guam was marked by record tonnage of naval bombardment in which thousands of Japanese and Chamorro’s lost their lives and the city of Hagatna was nearly destroyed. 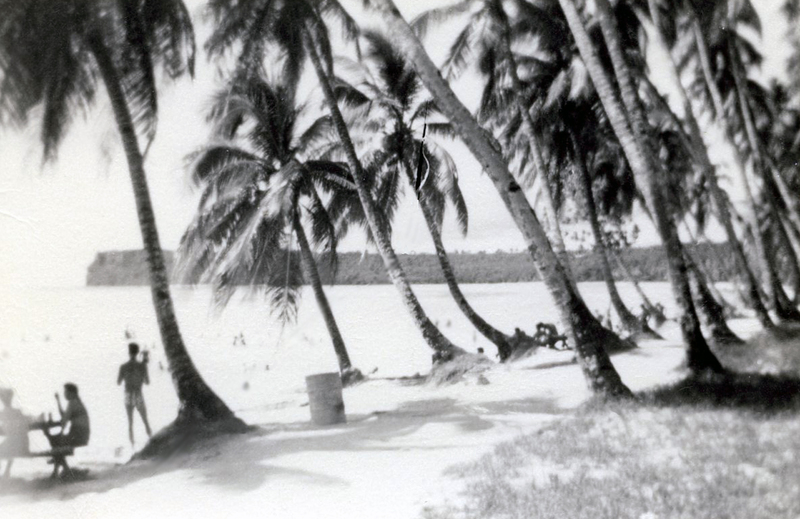 American forces landed on July 21, 1944 at Asan and Agat beaches. In honor the bravery and sacrifices of all those who participated in the Pacific Theater of World War II, including soldiers, sailors and marines of the United States, Japan, Australia, Canada, China, France, Great Britain, New Zealand, the Netherlands, and the Soviet Union the landing area has been designated as the “War in the Pacific National Historic Park“. 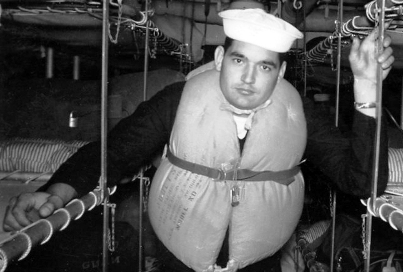 During the following bitter three-week campaign, 7,000 U.S. and 11,000 Japanese lives were lost before Guam was reclaimed and once again under American administration. Today, July 21st , Guam Liberation Day, is a major Guam holiday. All Government offices and most businesses are closed as the island celebrates with day long fiestas and a parade down Marine Corps Drive in Hatagna. Due to its strategic position, Guam was used as a command post for U.S. Western Pacific operations until the War concluded in 1945. On May 30, 1946, the U.S. 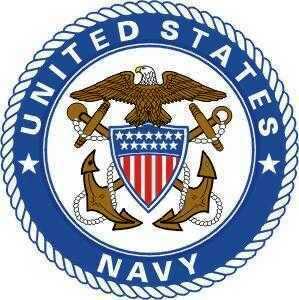 Naval Government was re-established. 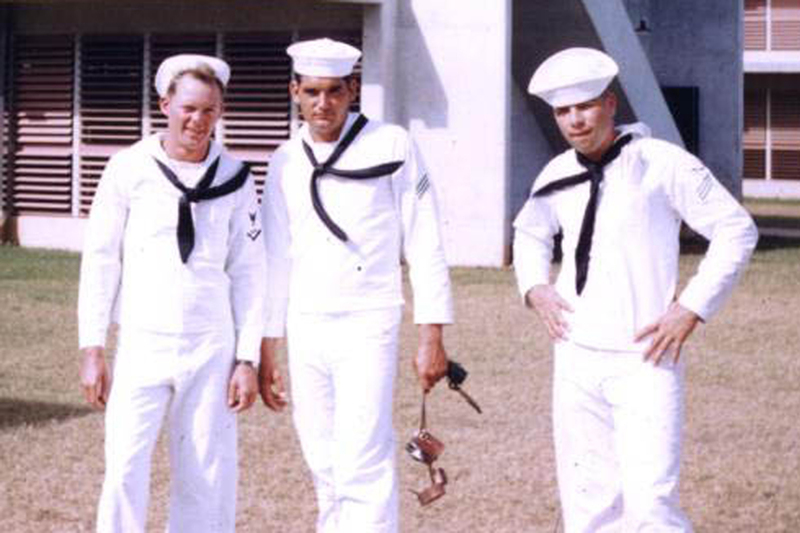 Although concluded over 50 years ago, Word War II still exerts a major influence on Guam . Relics and evidence of the War are still evident all across the island and divers can survey wrecks of Japanese, American, German and other ships and airplanes under Guam ‘s warm clear waters. On January 24, 1972, the last Japanese World War II holdout, Sergeant Shoichi Yokoi, was discovered in the cave in which he been hiding since his unit was scattered by the advancing Americans in July 1944. Sergeant Yokoi’s cave at Talafofo falls has been preserved as a popular attraction for visitors. As the Westernmost U.S. soil in the Pacific, Guam today remains a strategic outpost for the U.S. military. In 1949, U.S. President Harry S. Truman signed the Organic Act making Guam an unincorporated territory of the United States with limited self-governing authority and granting American Citizenship to the people of Guam. 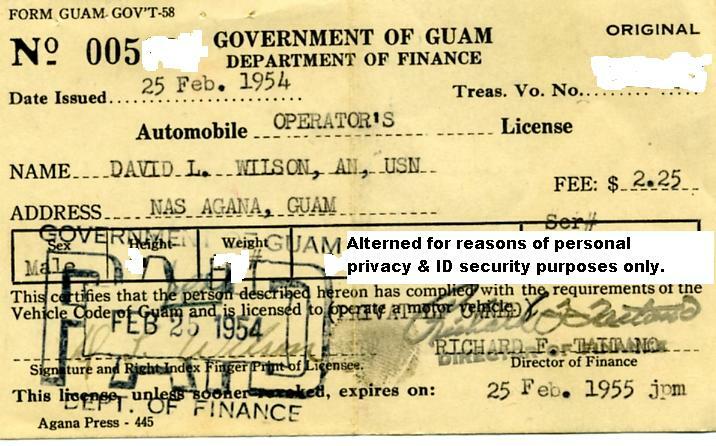 In 1962, security clearance requirement for travel to Guam, which had been in place since World War II, were lifted permitting Guam’s economy to flourish and opening and influx of new residents of diverse nationalities and races such as Filipino, Japanese, Korean, Chinese, Indian, Pacific Islanders and Caucasian. Guam of today is a truly cosmopolitan community with a unique culture, the core of which is the ancient Chamorro heavily influenced by the Spanish occupation and the Catholic Church. Strong American influence is also evident in the celebration of many public holidays, the form of Government and the pride in being U.S. that is displayed by the populace. 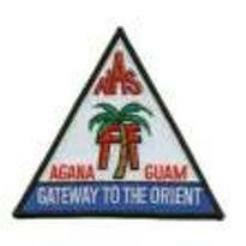 Guam ‘s culture has also been influenced and enriched by the Filipino, Japanese, Korean, Chinese and Micronesian immigrants each group of whom have added their unique contributions. The present population of Guam, 2006, is approximately 171,000 of whom roughly 37% are Chamorro, 26% Filipino, 11% other Pacific Islander with the remaining 26% primarily Caucasian, Chinese, Korean and Japanese, all of whom bring their cultural heritage and customs and contribute to Guam ‘s unique culture and appeal. The core of Guam culture, the Chamorro, is characterized by a complex social protocol centered upon respect, caring, accepting and helping one another. Inafa’maolek, or interdependence, is a central value in Chamorro culture which depends on a spirit of cooperation. Historian Lawrence Cunningham in 1992 wrote, “In a Chamorro sense, the land and its produce belong to everyone. This is thearmature, or core, that everything in Chamorro culture revolves around. 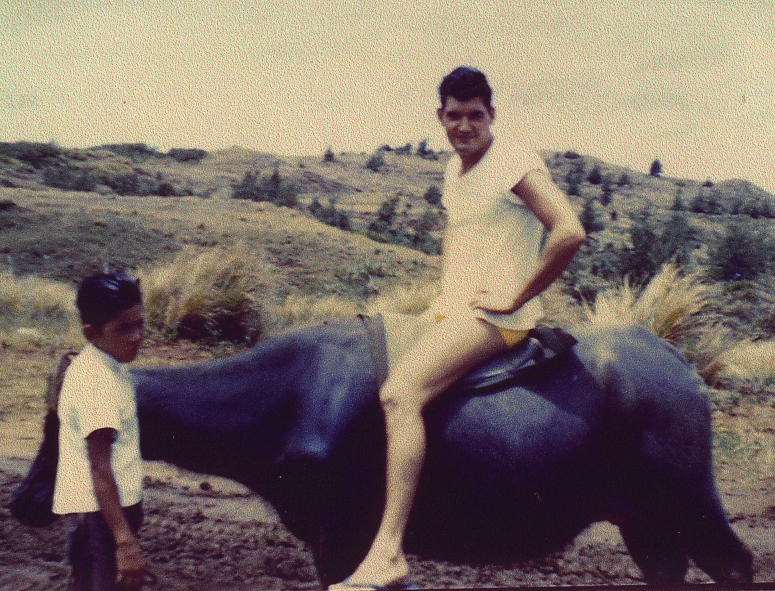 It is a powerful concern for mutuality rather than individualism and private property rights.” The culture is visibly manifested in the kissing of the hands of elders, passing of legends, music, dance, chants, courtship rituals, handicrafts, burial rituals, preparation of herbal medicines, and requesting forgiveness from spiritual ancestors when entering a jungle. 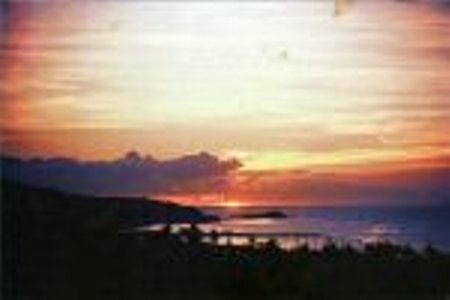 Glimpses of Guam culture are evident in local legends and folklore such as the taotaomona (ancient spirits), doomed lovers leaping to their death off Two Lovers’ Point (Puntan Dos Amantes), and Sirena, a beautiful young girl who became a mermaid. The Spanish occupation was based on conquest and conversion to “save the heathen souls”, implemented by force, which nearly resulted in the total extermination of the pure Chamorro race. However, the Spanish failed to recognize that the Chamorro culture was matrilineal and largely ignored the influence of the Chamorro women, which likely accounts for the fact that the Chamorro culture has endured to this day. The greatest influence of the Spanish over Guam ‘s culture was through the Catholic Church which has, since the 17th century, been the center of village activity. Today, every village has its patron saint whose feast day is celebrated with an elaborate fiesta, to which the entire island is invited. These fiestas, whereupon by duty, extended families contribute food and work to cook for the village guests remain a key attribute of the culture of Guam to this day. Spanish influence is also evident much of Guam’s present day architecture, especially in the Southern Villages such as this Spanish bridge in the village of Umatic. Guam has an abundance of historical and cultural landmarks and points of interest that cover all perioed of Guam’s history to include the ancient Chamorro, Spanish era, Japanese occupation and Liberation. You are currently browsing the archives for the Guam category.